Planning has been approved for a new housing development in Blackburn that will aim to set new standards for family living. The development called Green Hills is the brainchild of award winning designers and husband and wife team, Gerardine Hemingway MBE and Wayne Hemingway MBE along with architects ID Partnership and housing developers, Kingswood Homes. The team are planning to create a new community of barn inspired homes set around two interlinking village greens. Called Green Hills to reflect the surrounding views, the development will also have new cycle ways and footpaths to incorporate the existing Witton Weavers Way, as well as a new community hub. 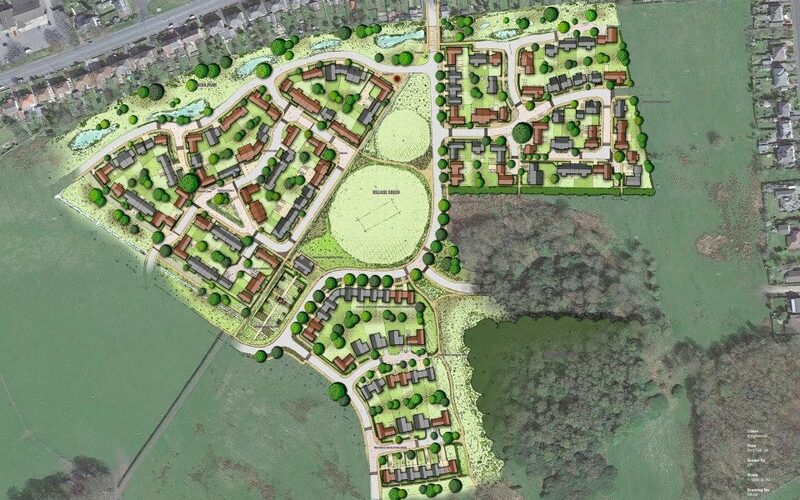 The scheme, on Livesey Branch Road, will provide 167 detached and semi-detached properties as part of the wider Gib Lane masterplan and was approved by Blackburn and Darwen Council’s planning committee last week. The designs feature houses that have been specifically designed and developed for the site with a variety of exterior finishes and internal layouts that will sit around rural landscaped courtyards or facing the open space. In addition, the first phase of 61 properties will showcase 41 different designs that the team says aims to avoid the look of ‘an estate with identikit little boxes’. These will be aspirational, attainable properties for people looking for quality of life and a new house they will be proud to call home. With green open spaces, village greens, cycle routes and views across rolling countryside, our new homes will definitely be worth waiting for. The first phase of development at Green Hills is due to start early in 2017.